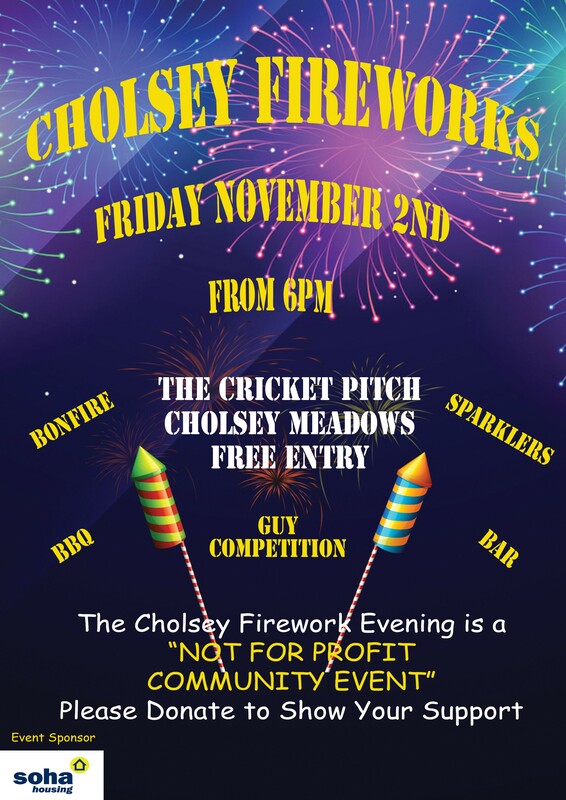 Join us from 6pm on Friday, 2 November for Cholsey Bonfire Night! 6pm: GUY competition and lighting of the Bonfire (anyone can enter a Guy. Simply bring it to the cricket pavilion between 4-6pm). 7pm: ‘Quiet’ Firework Display to music. A cash BBQ, Bar, Hot Drink stall, Sparklers and Glow Sticks available from 6pm. This FREE community event is sponsored by Soha. There will be bucket shakers collecting donations on the night. Please give generously to support this event and to ensure it returns each year.